We have been sailing a 42′ Morgan ketch rigged yacht operated by Dolphin Landings on St. Pete Beach on the gulf coast of Florida. The dolphins come in to us before sunset about 6pm then stay with us as we cruise out into the gulf from Boca Ciega Bay. We watch the sunset on open water, sometimes seeing a Green Sunset which is auspicious. Then we continue to drum back into the dock arriving about 9 pm. It is a magical event. The drumming beats have to be right for the dolphins to stay with us. It usually takes the group a while to settle down and get into the laid back slow grooves that the dolphins like. The deep downbeat tone goes out into the water through the hull. Sometimes the dolphins put their nose right up against the side of the hull where I am playing. Once during a wedding ceremony several dolphins swam on the side where the bride was sitting in her white dress. The dolphins sang to her for most of the way back in-an hour. I had never heard dolphins sing in harmony before. There was a lot of love on the boat and the dolphins picked up on it. The ultimately slow trance groove that the dolphins responded to was a six beat pulse with the low middle-of-the-drumhead downbeat tone happening every sixth beat on the “one”. This orients the group and the dolphins to anticipate the next downbeat pulse at a relaxed pace. They have jumped up in the light of the full moon then repeated the jump, picture perfect. Sometimes they have bundled up in a ball at the aft and swirled around each other in a splashing ball of four or five smaller dolphins. If they don’t like the groove because it is too aggressive and loud, they will pull back and cruise at a distance of about forty yards. When we get slow enough to maintain a meditative 6/8 swinging groove at about forty beats a minute they come in close and cruise with us. They will click and chirp too. This is always a chancy situation. Sometimes they will not show themselves if the water is too rough or the captain is being dork. This happened on the Atlantic coast at Lake Worth where the captain was a young pushy know-it-all. The boat was full of people, about two dozen, and we drummed the right way but the dolphins would not show themselves. We could feel them out there but for some reason they would not surface. In the middle of the voyage the young captain started boasting about HIS big drum. He brought out a cannon. An actual cannon that used a shotgun shell. The heavy cannon was set up on the deck pointed out at the water. It was about three feet long and on wheels. It was like a real cannon on a pirate ship! The captain insisted that I shoot off his cannon. It was really loud and everyone covered their ears. The blast reverberated down into the water. No wonder the dolphins would not show themselves. Next cruise is on May 24, Friday at 6pm at Dolphin Landing on St. Pete Beach. 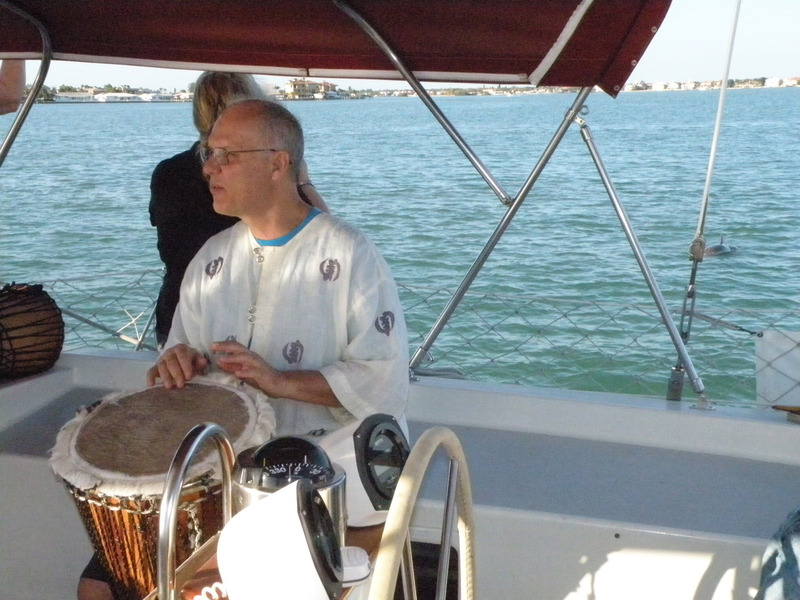 The next drumming full moon dolphin cruise will be with Capt. Dan on his 42′ Morgan called “Magic” out of St. Pete Beach. Capt Dan. is the perfect person to run the ship. He is considerate, practices yoga, eats healthy and has a great sense of humor. His compassion and wisdom of the sea is endless. It is always a pleasure to sail with Captain Dan and his crew at Dolphin Landings. Sign up on line to assure a place on board the “Magic” either on my website or on Dolphin Landing website. This entry was posted in dolphin drumming, Dolphin Sailboat Full Moon Drumming, drum mantra, DRUMMING ADVENTURES, Mediation drumming workshops. Bookmark the permalink.